It is getting very, very exciting in the gold (GOLD) market. What happens in gold as well as gold stocks around current levels will have a serious impact in the gold market. It will directly impact our gold forecast for 2019, our silver forecast 2019 as well as a major bullish move in gold stocks and silver stocks in 2019 (or impede it). The ultimate risk gauge in the gold market is the junior gold stocks to gold price ratio which right now sits a major breakout point. Any confirmed breakout will have explosive effects for the precious metals market, but the opposite may be true as well. 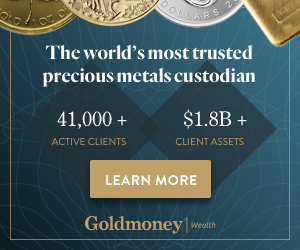 The monthly gold price chart revealed that the most important test of 2019 was about to happen: a test of the $1350 to $1375 level. We identified this as THE most important level to watch for gold bulls. Note that per Tsaklanos his 1/99 Investing Principles it is key to identify that handful of criticial price points on any chart, and monitor trends as a function of those price points. This leads to mental and emotional control as opposed to stress. One of the very important indicators we track is the junior gold stocks to gold price ratio. We consider is a gauge for risk sentiment in the precious metals market. Note that we consider this a secondary indicator, not leading. In other words it should be read and interpreted in conjunction with price charts, i.e. the critical price points drived from the long term gold charts. The junior gold stocks to gold price ratio is a pressure cooker ready to explode. A breakout took place recently, but more work is needed to confirm this breakout. A confirmation would benefit gold stocks as an asset class in 2019! It really is going to happen anytime soon in the precious metals market. Either an explosive breakout or weakness, either of the two, and we will know very soon.